One thing I like about cooking for bento is the single serve aspect. While it is difficult to downscale some recipes at times, you get a better chance to experiment on new dishes. That way, if it doesn’t turn out the way you want it to, it’s not difficult to finish it yourself. A classic example is this enoki dake wrapped in bacon. A popular appetizer in Japanese restaurants, this is one recipe I haven’t perfected yet. I used to pan-fry this, letting the bacon render its own fat until browned but I found it a tad oily. I figured I’d try cooking it healthier by leaving it on a wire rack in the turbo broiler, as recommended in one of my cookbooks. Unfortunately, the enoki dake browned too fast, even before the bacon had a chance to crisp up. Mostly fail, but since I was the one eating, I didn’t hear any complaints. To make up for the sad enoki dake, I brought along smoked tanigue, a local, meaty fish that soaks up the smoked flavor so nicely. To go with it is some Dill Sauce, packed in the Hello Kitty Mayo cup. I bought both tanigue and dill sauce from Santis. More good eats from them, yum! Then, finally, some grapes. Also included in this meal is a chunk of baguette, pre-sliced just until the edge so it would still stick together as a loaf. I used one of my onigiri boxes; the triangular dome top meant for onigiri is just perfect for a small loaf of bread. And you thought it was a single purpose box? great idea! I bought one of those boxes to use for other things like sandwiches and fruit since I dont eat many big onigiri! it doesn’t smell naman, tho? Hi.got an award for you.Drop by my site..have a nice day! your bento makes me hungry. i have to try that too. thanks for sharing. Oh, fruit sounds like a good idea too. Must take note of that. Nothing unpleasant naman. Think smoked salmon? 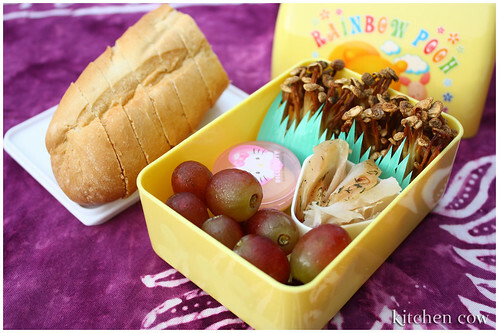 Came across your blog for the first time, I’m really enjoying your bento pictures! They’re so kawaii! My fiancee, Garandee, occassionally makes me obento to bring to work but she just uses disposable plastic food containers. That’s because I warped the last two bento boxes she bought me when popped it in our pantry’s microwave for heating.